I really enjoyed this book by Jacqueline Wilson. It was intruiging and I couldn't put it down. My favourite character in the whole book was Shirley with her love for books and her eager-to-impress attitude. My favourite places in the book were probably the grounds of the house. They sounded really beautiful and mysterious. The book was a very detailed and accurate first-person account of the Second World War, all the way down to the clothes the characters wore. It sounded like a 100% match to what life was like for evacuees in the country. This is not the first book I have read by Jaqueline Wilson and it shall not be my last. This book has lived up to the standards and quality as all Jacqueline Wilson books and I recommend it to all 8-12 year olds. This book was amazing I couldn't stop reading! I loved Archie because of his funny personality and joyful attitude. I thought the history in the book was definitely very realistic and it has inspired me to research more about World War 1 and the evacuees. I have already read a lot of Jacqueline Wilson's books and I always love to read more. This is an amazing book and there is not really anything wrong with it. 'Wave Me Goodbye' is a story following young Shirley Smith when she is suddenly evacuated to Meadow Ridge, there she finds herself living with a secretive woman called Mrs Waverly. I thoroughly enjoyed reading this book as it gave me a glimpse at the life of a child during WWII. I also liked reading about all the different characters, they all were very intriguing and had interesting backstories that were quite unexpected. The way this book was written it seemed as if you were really there, really there with all these amazing characters and living their lives with them. It was was fascinating to me as WWII is one of my favourite history topics. If I had to describe the book in three words I would probably say ˜An excellent read' because it was truly wonderful and I hope to read it again in the future. This book's illustrations were fantastic. It seemed as if the picture I had in my head of the characters had been projected onto paper and been put in the story. It also showed you a more in-depth look at what the characters were feelings by their expression on their faces or the way their body was positioned. I definitely recommend everyone to read it because it was a lovely, heart-felt story. It had everything a good book needed and every chapter left me wanting to read more and more. I would rate it a 9/10 because the only problem with it is the fact you canâ€™t stop reading. Join Kevin, Shirley and Archie on an adventure in the country side. They are all very adventurous children but some things go wrong after they arrive. This was supposed to be a holiday for Shirley (as her Mum called it that,) but instead it turned out to be a mixture of clumsiness, embarrassment and danger. I loved this story because I have learnt much about World War 2, so it was really interesting hearing a story of some kids that were actually there. This book inspired me to learn some more about the war and other peopleâ€™s experiences. I also really like Jacqueline's books because of how they mostly focus on one person and how they are feeling about the world around them. I also liked how Jacqueline Wilson left the story on a cliff hanger. I was really wondering by the end, did Shirley's dad die in the war? Was her Mum okay? What happened to all the children? Did they stay safe in the red house? Did Shirley's friend Jessica live happily with her granny after she was expelled from her school? Did Shirley ever see her again? All these questions were going round my head after I had finished the book. I enjoyed the book so much that I wished the book would go on and on forever. My favourite character of the book was Shirley. She was very strong, and she always stood up for people. I also like Chubby because even though the children were quite naughty at times, she didn't mind and she didn't punish them badly. Sometimes Chubby was a bit unfair though. Her favourite child was definitely Archie, and everyone knew that. She was always looking after him much more than Shirley and Kevin. I really enjoyed this book and I think Jacquline Wilson is a really good writer. I think she should write more stories of these children in World War 2 as they are really good stories. I really enjoyed reading Wave Me Goodbye. I particularly liked Archie because of the way he talks and also because he doesn't know his animals and they do, which I found funny! I thought that the part where Shirley goes and says "bye" to her mum was very sad. This book made me want to find out more about this period in history and read more books by this author. I think this book is very interesting and an enjoyable read. It is about a girl called Shirley who lives in London, but World War II comes and her mother tells her she is to be evacuated to a little village. When she gets there she amongst the last to be chosen to live in someone's home. Finally, she is taken her in with two other boys Kevin and Archie. She makes a few friends but she also meets a few people who pick on her when she is evacuated. My favourite characters are Shirley and Alfie, because he is sometimes cheeky. This book was both worrying to read and exciting. I would like to read more Jacqueline Wilson books. Wave me Goodbye is a really emotional book. It made me cry at one point. Its about an evacuee called Shirley. It starts off slow and her life changes . Her mum makes her go on a train to a school called St Agatha Convent so that she is safe but she doesn' want to go. She meets some awful girls on the train but also someone who becomes her best friend. When she gets off the train no one wants to take her so a lady is forced to take her and two boys . The house where she ends up staying has a secret room,one where no one is allowed to enter. She finds the key one day goes in and discovers a giant doll's house. There's lots of questions to be answered which she discovers as the story moves on. I have read many books by this author and have enjoyed them immensely, but this book rose above them all for one specific detail: the history. Not only this, but the way the emotion has been captured and written to perfection enhances the quality of the picture you get in your head when reading. Certain sections of this book are very emotional, such as when Shirley has run away to find a special visitor at her house (you'll have to read the book to find out what I mean!) Occasionally, but in this genre more often than not, you come across tragedy. Coming into this book I realised the element of tragedy would be common, considering the subject matter, but this area which most children are upset by has been carefully written by Jacqueline. She has made all of the history seem real without feeling threatening. I know quite a bit about World War I and II from school and from ancestors with war connection but reading this has shown how the war effected not just several countries, but individual ordinary people. If I had the chance to find out more about war and how it affected people, I would take it. This book is about a 10 year old girl called Shirley. She wakes up one morning to find that she is being evacuated to the countryside with her school. This book is set during World War Two where most children were evacuated to the countryside.Â Shirley is evacuated to a big house with two boys, Kevin and Archie. In the red house there live two women (Chubby and Mrs Waverly) but the house is unfurnished. In this book you find out the reason for this and many other secrets. I enjoyed this book and I would recommend this book to other children my age. The history in this book was very realistic; it made me feel like I was the one being evacuated, and I now know more about World War Two evacuees than I did before reading this book. After reading this book I would like to find out more about the war. This book has also made me want to read more books written by Jacqueline Wilson. It was really fun at points when Archie was running about in the striped jumper and then when they were playing as soldiers and when Shirley showed them her knife. There was also a really cunning secret when her mum explained about the little trip but didn't explain about being evacuated. When they were on the train I thought she would go with the other Paradise Rd pupils but instead she snuck in with the convent pupils. Kevin and Archie were probably Shirley's least expected partners for billeting. When they got her the tunic I thought of what she would look like and she looked horrendous in the clod hoppers and shirt. It was a big surprise when the army van came up and gave them their camp beds. When Archie went in the lake I was really surprised because he wanted to swim but he sank and Kevin and Shirley had to fish him out. It was emotional at times but it was also ambitious when they tried to escape. I was glad Kevin owned up to the bed wetting incident. I don't normally read Jacqueline Wilsons but this has made me more interested. I rarely read historical books but I really enjoyed this. I really enjoyed Wave Me Goodbye because Jacqueline Wilson used different vocabulary and included some great Victorian language. I also really enjoyed the book because Jacqueline used amazing description which made the story very interesting. In the book the history was very realistic because it was all about the evacuees and the Second World War which made the story very enjoyable to read. I would definitely like to read more of Jacqueline Wilson's books because I really the style she writes in, especially the vivid description she uses. I would also like to say that the cliff hangers she uses at the end of the chapters make you want to read on. Overall I really enjoyed the book. What the story is about: The story is about the evacuees who were sent away to the countryside because of the second world war. A girl called Shirley Louise Smith was one of the evacuees, and she lived in London with her mum and dad. Her dad was a brush salesman, but he joined the army. Shirley's mum became a secretary for a weapons factory when her daughter was sent to the countryside. Shirley wakes up one morning expecting a normal day, when her mum tells her she is going on a 'little holiday'. What she actually means is that Shirley is being evacuated away from her home and her family. On the train, Shirley is seated next to pupils who go to St Agatha's convent, and they are supervised by a nun who looks like Charlie Chaplin. Shirley makes friends with the only nice girl who goes to the convent, and her name is Jessica Lipman. At the end of the train journey, when everyone gets to the village hall in the countryside, Jessica has to go with the rest of her fellow pupils to a house called the 'White House'. That's where they do their lessons, and it's also where they sleep and eat meals. Shirley is really sad as Jessica was a really good friend. Then the villagers have to choose which children they want to look after. Shirley and some other people aren't picked, and they have to wander round the village with a nice lady who is Chairman of the Ladies Institute. The other children get taken in by some more villagers, but three still remain including Shirley. They have to go to the last remaining house which is on top of a hill. It is called the 'Red House'. A woman called Mrs Waverley lives there, along with her friend and maid called Chubby. Chubby takes in the youngest person called Archie because he's only little, and Mrs Waverley takes in Shirley because Shirley likes books. Only one person remains, and his name is Kevin. Shirley persuades Mrs Waverley to keep Kevin, at least for one night anyway. The three evacuees have bread and milk for supper, and they go to bed afterwards. Unfortunately, the rooms have no furniture and Shirley doesn't want to sleep with boys at all. She ends up sleeping in another room on her own. Exciting events happen at the 'Red House' and Shirley starts to enjoy her time there, even though Mrs Waverley is really rather weird. Also, other secrets remain undiscovered in the mysterious household. Shirley discovers everything in this great book about the evacuees. What I like about the book: I like the bit in the story when Shirley meets Jessica, as it's nice that they are friends. Beforehand, Shirley doesn't have any friends at all. I think the saddest bit in the story is when Shirley departs on the train, and she leaves her mum waving at her on the platform. I find that bit sad because Shirley doesn't want to leave her mum at all. I found this book really realistic, and it helps if you are learning about evacuees and the second world war. I recommend this book to 8, 9, 10, and 11 year olds. Out of ten, I think this book is 8 out of 10. 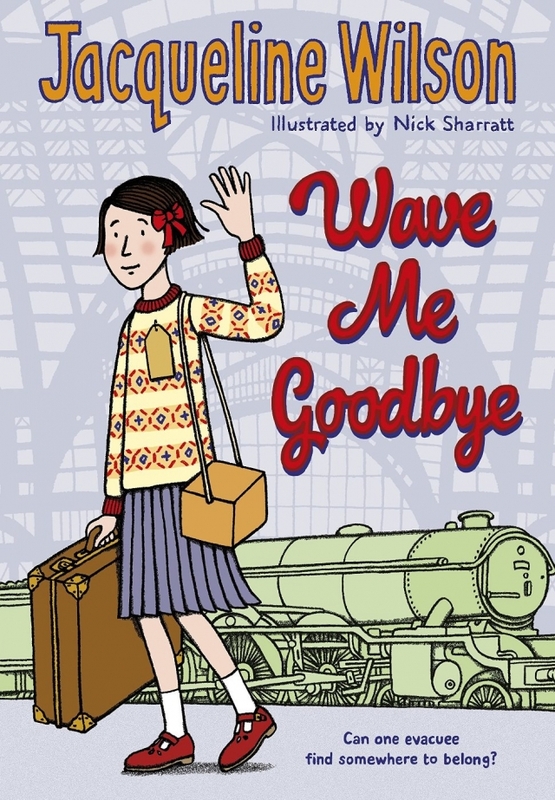 Jacqueline Wilson has written a lot of stories, and Wave Me Goodbye is one of her most recent books. Jacqueline Wilson writes realistic stories, and they are sometimes quite sad. She is now one of Britain's most famous authors, and she likes writing in different time periods. Wave Me Goodbye is a very good book, and I have enjoyed it loads. I hope lots more people read this book and enjoy it. I think this book was very good and I really enjoyed it! I liked Chubby because she seemed like she had an unusual personality and could sometimes seem a bit mean but she always meant well. This book is very good and I would change nothing about it, what I thought was especially good was that even when you get to the last chapter you can't predict how it is going to finish. I am pretty sure that some things in this book were true such as how they got evacuated to thee country for war though the actual story was friction. This book has definitely made me want to learn more about WWII, which is lucky as that is our new topic in history. I really want to read more of Jacqueline Wilson's books because I really like her style of writing. My favourite character is Shirley Smith (The main character) she loves books and can't put them down (like me). She has a very bright imagination, and can imagine any character from any of her books and make them come to life. Shirley was an evacuee from London and was sent with her school to the countryside to avoid the bombing from Germany. She is lined up with her school and sees the St Agatha's school (another school being evacuated) she pretends to be a pupil from that school and ends up on a train with them ; she then makes a friend called Jessica and becomes BFFS with her. When they arrive she gets caught and sent to her actual school after half an hour of waiting to be selected by couples Shirley, her headmaster and four other classmates set off in search of a home. Two girls get taken in, while Shirley is left with two boys named Kevin (who is only eleven but extremely tall) and Archie (who his auntie had his hair shaved of because of nits). Her home (Also Kevin and Archie's home) is finally selected; it's a strange home with strange Mrs Waverly and Miss Chubb with secrets to be discovered. I have already bought/read over 6 books of this author and more being released every year. I would like to know how many evacuees ran away from their selected homes and how many didn't go home. Shirley was definitely my favourite character as she reminded me of myself. This book made me think about history and want to learn more. My mum's friend races pigeons and and they used to help bring messages in war time we are going to see them and see how they used to do this and how they were trained. For the last couple of weeks I have had the pleasure of reading, Wave Me Goodbye by Jacqueline Wilson. This book is a great read and I never got bored once; the thing that makes Wave Me Goodbye such an enjoyable read for me, was Chubby the house maid she isn't like any normal housewife and always has her own opinion which is usually right. This book just makes history so much more fun and easier to learn about, it is also a realistic story about an evacuee. I am now very excited to learn more about history and especially evacuees. Furthermore I am so eager to read any future books by Jacqueline Wilson especially ones with such a lovely ending like Shirley's. I enjoyed this book because it showed all the actual emotions an evacuee in World War Two might have felt including: sadness, excitement and nervousness. My favourite character of all was Shirley (Louise Smith) because she was very brave, funny and nice also as she stuck up for people she didnâ€™t really like (Kevin, who was one of the children she was put with).